I went to Paris, France this past weekend. Paris truly is the city of romance. It was incredible and gorgeous. The trip started off horribly early in the morning. We had to wake up at 3:30am in order to make our 6:00am flight. We were exhausted all day but that did not stop us from seeing the city. Once we landed, we checked into the hostel and were off. The first place we went to see was Notre Dame and the Love Lock Bridge. Notre Dame was cool, but it was the Love Lock Bridge that I found more interesting. I have always wanted to see the Love Lock Bridge. I love the whole idea and meaning behind placing a lock on this bridge with your name and your significant others name on it, ensuring that your love will last forever. The messages that people wrote on their locks were so sweet and beautiful. I am so looking forward to the day that my future husband and I come to Paris together and place a lock of our own on this bridge. The cluster of locks come in all shapes and colors, and combined all create a work of art. We decided that we could not leave Paris without having a crepe, so from that point on we were on a mission to find a crepe stand.We eventually found one and all tried something different. I got a nutella and cinnamon crepe, my roommate got a nutella and banana crepe and our friend got a crepe with eggs, french fries, cheese and ham. It was the perfect snack. Next up on our list of things to do was visit the Louvre. The outside of the museum was incredible. I loved the modern glass pyramid that sits outside the Louvre. This was one of my favorite sites we saw while in Paris. The inside of the Louvre was filled with art from all different time periods. It was overwhelming at times to see how many different rooms there were filled with art work. I am not the biggest fan of museums, so my interest and attention span did not last long once we were inside, but we did spend a good two hours there looking around all the different rooms. I thought the room with the Egyptian remains was the most fascinating out of everything we saw inside there. It was cool to see these remains because they looked just like they do in the school history books. We also saw the Mona Lisa and Venus de Milo. If you are a student, bring your passport or student identification in order to get free admissions into the Louvre. After the Louvre, we headed towards the Eiffel Tower. It was dark out at this point so the Eiffel Tower was all lit up with lights. It was gorgeous. It literally took my breathe away. Seeing the Eiffel Tower has always been a dream of mine, but it was even better in person than I ever imagined. It was so spectacular and romantic. I fell in love. I could have stayed there all day and all night just starring at the tower in awe. It is incredible. I was like a little kid in a candy store jumping up and down and so excited to be at the Eiffel Tower. The next day we went back to the Eiffel Tower and took the elevator all the way to the very top. The view from up there is indescribable. It was one the most beautiful things I have ever seen in my life. I will never forget that moment! You can see a 360 degree view of the city from up there. Going to the top of the Eiffel Tower is a MUST SEE if you visit Paris. 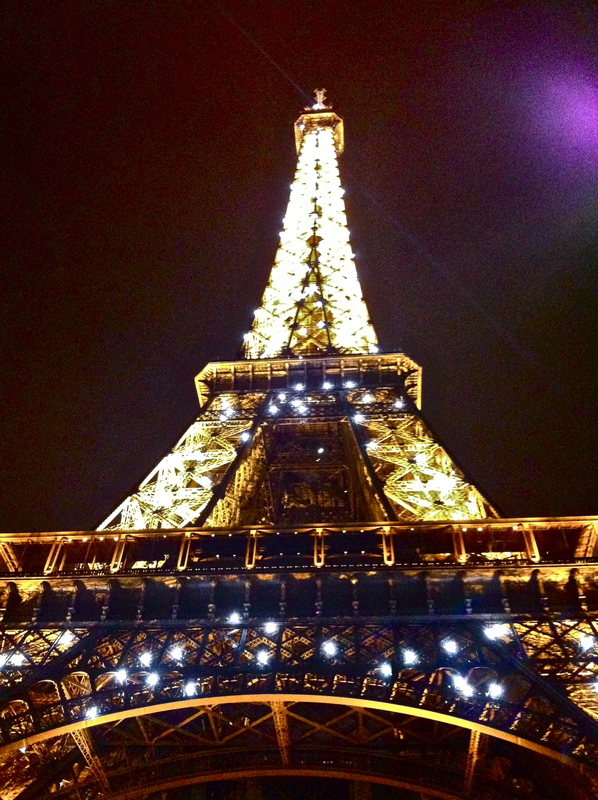 I cannot wait to go back to the Eiffel Tower some day and experience that rush and excitement all over again. Up next was visiting the Arc de Triomphe. This was really interesting to see in person. I have always seen it in pictures and in movies so seeing it first hand was really cool. We did not spend much time at the Arc de Triomphe because the sun was going to be setting soon and we were trying to make it to the Palace of Versailles before it closed. We hopped on the metro and headed to the palace. Along the way we transferred onto the train in order to get to our destination. Once we arrived, the police informed us that we were being fined for not buying a train ticket. We had used our metro passes the entire way because no one informed us that this was not the way to do it. We were not the only ones to get fined. While we were there, we saw four other people, mainly all Americans, getting fined for the exact same thing. They make tons of money off of fining you for not buying a separate train ticket, so if you travel to the Palace of Versailles, make sure you buy a train ticket in addition to a metro ticket. By the time the train fine was figured out and handled, the palace had closed. However, there was this very nice guard who allowed us to go up to the gate of the palace for five minutes just so we could take pictures. We had such an awesome weekend in Paris and it is a place everyone must see at least once in their lifetime. There is so much to do and see there. I cannot wait to go back and further explore the city!